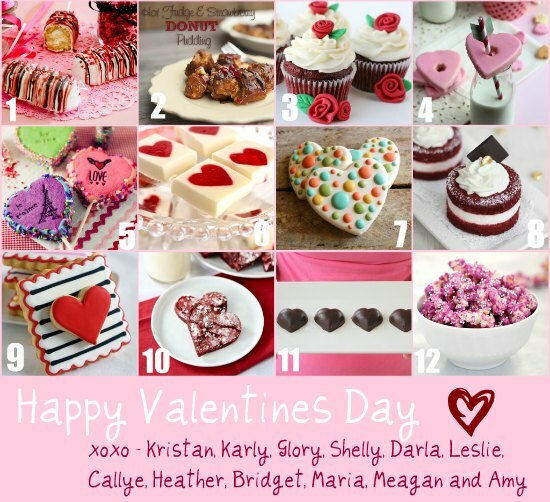 Today, I'm joining some of my favorite bloggers for a virtual Valentine's Day treat party. If you're looking for something special to make for your sweetheart, this is the place to be! This cake recipe is my go-to Red Velvet sponge roll, but instead of rolling it up, I've used a pastry ring to cut the sponge sheet into 3" stackable rounds. The rounds are filled with a light whipped cream and cream cheese mixture, then topped off with a little more of the same. I love to give (and get!) chocolates for Valentine's Day, so I used gold-covered chocolate buttons and a squares of Godiva chocolate for decoration. Of course, any square of good quality chocolate will work. If Godiva doesn't strike your fancy, a Vosages square would be yummy, or spherical Lindor chocolates or Ferrero Rocher would do the trick too! Be sure to visit all my friends for fabulous inspired Valentine's Day desserts! Preheat the oven to 350°F. Grease a jelly roll pan with shortening. Line the pan with parchment paper and grease the paper also. Place the eggs in a stand mixer fitted with the whisk attachment, and with a timer set, beat for 5 minutes. Slowly add the sugar and oil. Beat well. Add the buttermilk, vinegar, vanilla, and red food coloring. Switch to the paddle attachment. Sift together the flour, cocoa powder, baking powder, and salt, and slowly add to the liquid ingredients. Beat for 2 minutes, until well combined. The batter will be very thin. Pour the batter into the prepared jelly roll pan and bake for 12 to 15 minutes. When done, the cake should spring back when touched in the center. Allow cake to cool in the pan. Use a 3” round cookie cutter or pastry ring to cut 12 circles from the red velvet sponge. Place cream cheese in the bowl of a stand mixer fitted with the paddle attachment and whip until fluffy. Pour in heavy whipping cream and beat on medium high speed. Gradually add sugar with the mixture running, until stiff peaks are formed. Place pastry rings on a large baking sheet, if using. Place one round of cake at the bottom of the rings and spoon in 1/4 cup whipped filling. Top with second cake round. Alternatively you may use a piping bag and decorator tip to pipe about 1/4 cup of filling on one cake round, and then sandwich with a second. Cover cakes and refrigerate for 2 hours. Transfer remaining filling into a piping bag fitted with star tip. Gently press the cakes out of the mold. Pipe a decorative swirl on the top cake and garnish with gold button or dragee and chocolate square. These are gorgeous, Heather! I may have to make them for my husband and me for our Valentine's Day dinner! ADORABLE! I am in love with those Buttons~! I love this! Where did you find those buttons??? ooh these are so darling. Elegant and cute at the same time. What beautiful cakes!! They look picture perfect for the most elegant dessert. Gorgeous little cakes! Love them! Oh, so pretty and divine looking! Those are perfect. The pictures are wonderful too. These look like they belong at the fanciest of restaurants...they are just PERFECTION!!! I am totally ordering some of those gold buttons, too! These are stunning, Heather! Stunning!!! The decoration of these is perfect! I need some gold covered chocolate buttons like now. My life will not be complete until I have them. Also, can you come over and make these for me? Es mi tarta favorita y así en minis o individuales me han encantado. So pretty! Love the gold buttons! I think today should be declared Red Velvet day! lol......so many of us posted RV recipes today!! These are so gorgeous!! Such a beautiful and elegant dessert! Oh my goodness, these are so adorable!! Love velvet cake! Those are especially beautiful. This is so pretty! I absolutely love what you've done here. So chic! And adorable. I'm with Jessica, we can eat more than one right? Just like everything you do, these are beautiful!! Perfect for Valentine's Day! And the gold buttons? In. Love. I'm pretty sure everything you touch is magical! These are gorgeous! I love that they are individual servings. Something about small bites makes the dessert more romantic. Thanks for sharing! 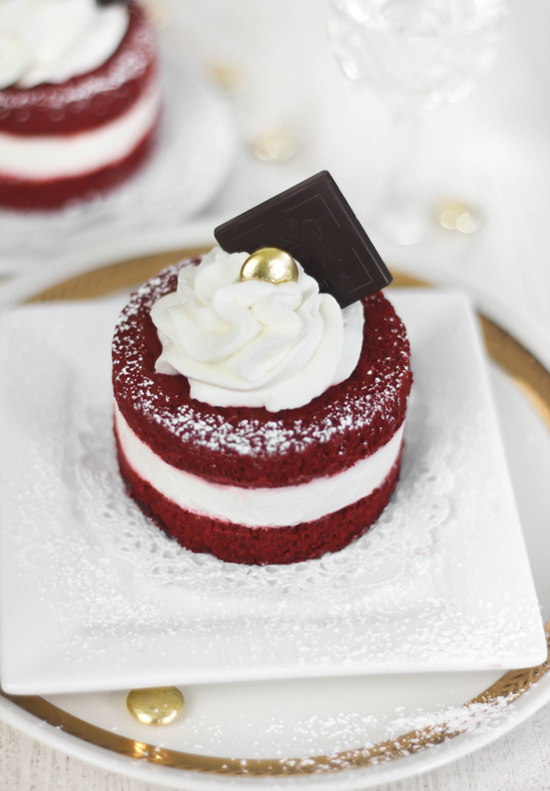 Everyone's red velvet food has been so amazing to see on all these posts, and yours is just as gorgeous as could be. As always Heather, you take food to the artwork level! What a wonderful mini cakes. the mini cakes are gorgeous! those are absolutely gorgeous!!! I love the gold chocolate button!! Red velvet cake is one of my all time faves!! Adorable and PERFECT! And thanks for that link to the online store... I just went there and it's great. Thanks for sharing. 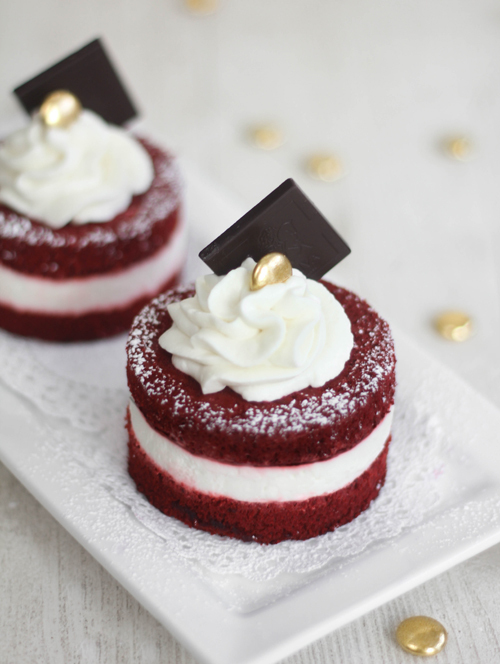 These little mini Red Velvet cakes are like something that would be served to a fairy~tale princess. I just adore your style! LOVE all the yuMMy Valentine treats! found you on pinterest. Love your desserts. Beautiful! I'm all excited for the big V-day now! These are beautiful! I could eat one right now! Fabulous recipes for Valentine's Day. So cute and creative ladies. Just had to say that I have a husband that just loves chocolate - specifically chocolate chip cookies. A few years ago I found a heart shaped pan with a chocolate chip cookie recipe that makes a 12 inch heart shaped chocolate chip cookie I wrap it up with plastic wrap and tie a huge red ribbon bow on it and set a valentine card on it every year. He waits all year for this cookie. I bought the pan which comes with the recipe at Michaels in their baking isle. The cookie is about 3/4 of an inch thick and amazingly is very good. Just thought I would share that for the chocolate chip fans out there. Picture perfect mini cakes!!! LOVE these beauties! Holy moly this looks amazing! However, when I purchased all the ingredients for my boyfriend's surprise red velvet cake for V-day yesterday, I pictured a final product far less golden-topped, far less bite size and overall far less perfect. NEW PLAN- blindfold him and feed him mine and when he's done show him the photo of yours and say that's what mine looked like before he ate it. Perfect. Love the way you decorated and styled these gorgeous little cakes! Where can I find these pastry rings? I really was wanting to make something like this, but wanted that nice finished look the rings would provide....Are they three inches high and in diameter? These look so delicious and pretty. They also seem simple to make and assemble. Perfect for V-Day! These are beautiful! How did you get the centre to look so perfect? Not a crumb out of place. Perfect. This is such a cute recipe, great job! I've been visiting some of the round-up recipes and all of them are so much fun! What lovely little mini cakes you made. I'm a sucker for red velvet, so these would be my pick! They look lovely! I have been searching for a "mini" valentine's idea and I'm so appreciative of your fabulous ideas. I love reading your blog. You are a magic maker. I would love to be your Valentine :-). I totally love those gold covered buttons. Master Baker, I bow to you ! I have seen so many yummy red velvet recipes lately due to Valentine's Day. I want to try them all. These minis look awesome. These are stunning! I had to pin it on the CraftBliss Red Valentine Bliss Board on Pinterest and link back to you. Oh. My. Gosh. Just like every other comment above me, this is FANTASTIC! I am only 13 but I want to be an amazing baker/chef/cook like you! Thanks for another great recipe. I always love your simple little decorations! They are always so perfect! These are so pretty! Thank you for the recipe, it's the perfect thing to bake for Valentine's Day! These are so beautiful! I don't know if this is the same recipe as your heritage red velvet cake, but that one is a recipe I have used several times- once to make cupcakes for my brother-in-laws wedding! Again, I'm late to the party, but I'm glad I'm here! Love it, looooove it. Thank you for your great ideas...you inspire me every day...today you in my blog. These look PERFECT! I love red velvet anything, but never thought to cut them into little circles like this. It's a dessert of the perfect size, not too big, and it would be fun to share with friends. what speed i should use when beat the egg? thank you. These are absolutely adorable and so elegant at the same time! I'm in love with the gold buttons! I plan to make them tomorrow, but what size jelly roll pan did you use? Sorry for my tardy response! Pan size is approximately 10" x 15". Elegant and perfect as usual! I made ginger and white chocolate for Valentine's and our Wedding Anniversary. Love the gold decorations but then I do have a sprinkle obsession. These look wonderful!! I cannot wait to try them out! You must have the most amazing collection of props!!! Made these yesterday and they were delicious. The whipped filling was very creamy, fluffy and not too sweet which is how I like it. The cake was wonderful. My cake came out a bit on the thin side because I halved the recipe and the pan I used was a bit too big, none the less it was still divine and they look so pretty. These look delicious. Can't wait to try them. new (drooling) visitor here! Oh my, these look divine!! Just made these this afternoon for a church potluck! Turned out well, except for the thickness of the cake-they were a bit on the think side, but I just tried to make up for it and add a bit extra icing! :) Maybe I should have doubled your recipe? Or used a smaller jelly roll? these are the cuteset!!! but I have a question, when it says, refrigerate for 2 hours, is there any way I could freeze it instead to it will set faster? This looks delicious! I just shared this recipe on my red velvet blog http://momelite.com/red-velvet-heaven/. I hope you don't mind! Hi, i really love all your desserts!! i have a question, i am at the asia country. so may i know the measurement for the ingredients for cups and oz is in US or others? Hello. Can we use the same recipe to make cupcakes? I clicked on the link for the gold chocolate buttons. The link lead to Fancy Flours and when I searched for the buttons, they are not available. Please advise. Carolyn - currently, there's no good supplier for these in the US. Several UK shops carry them. 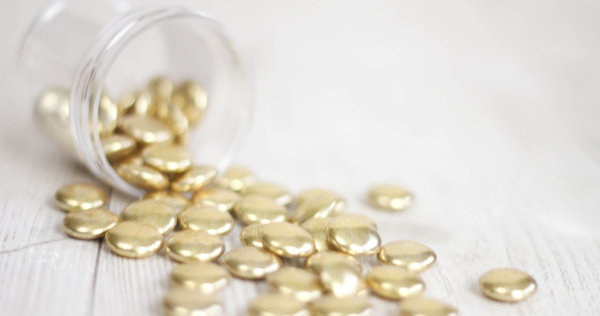 Follow the link to a good substitute - gold covered Jordan almonds. They are sold online and also available in some specialty wedding shops. My Oh My! These are amazing. So delicate, rich in colour and I'm sure in flavour. Mmm...to die for! To avoid messy edges, I'd advise freezing the filled caked. Use a warm dish towel to wrap around the sides for a minute before pushing them out. This will ensure the filling stays exactly where it is intended. When I made this, the edges did not get dry or tough. I kept them in an air-tight container in the refrigerator. These would be great for a graduation celebration dinner as these are our school colors! These were great and the recipe was so comprehensive! I personally thought that the whipped filling could use more sugar- I added more along the lines of 1 cup! Especially since these were for teenagers- I felt that was key! Thanks for the awesome recipe! Such a unique twist on a classic favorite! These are so cute. Maybe I'll try these this year. I was look for something unique. What size "jelly roll pan" did you use? Hi Autumn! This is a sponge cake recipe, so no butter is required. It's not as tender as a regular red velvet cake. If you've ever made a swiss roll, then that's the texture of these cakes. Not a problem! You're not spamming. :) You could probably manage the egg foam method with this cake. Beat the egg yolks as directed with the other ingredients, instead of whole eggs, and whip the whites separately. Fold the egg whites in at the end. Your volume will definitely be greater, so I can't say for sure if all of the batter will fit in the pan.